The constitution Bench of the Supreme Court of India on Monday clarified that the State Governments cannot conduct state level entrance examinations for the admission to Medical Colleges. The Court also held that the students who have either applied for NEET-I but could not appear or who appeared but could not prepare well, can appear for NEET-II. Rapping the Government for delaying the Lokpal’s appointment despite past assurances, the Supreme Court of India on Monday directed the Attorney General of India to inform the Court on the next date, the steps taken to make the Lokpal’s appointment. The matter has been adjourned for July 19. The Supreme Court refused to interfere with a Sessions Court Order which had taken cognizance of new offences and added new Accused under section 193 of Code of Criminal Procedure, though the Magistrate rejected the prayer at Committal Stage. A two judge bench of the Supreme Court of India on Wednesday issued landmark guidelines for disaster /drought management. 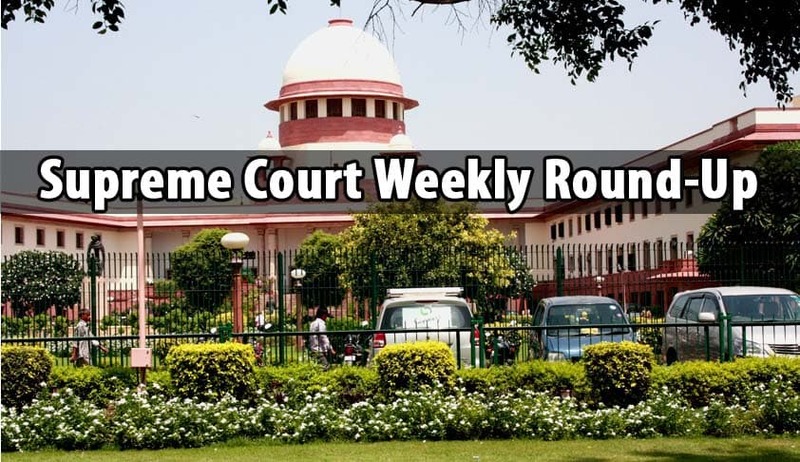 The bench comprising of Justices Madan B. Lokur and N.V. Ramana has issued the directions in a public interest litigation filed by SwarajAbhiyan. The Supreme Court on Wednesday provided massive relief to the telecom service providers by quashing Telecom Consumers Protection (Ninth Amendment) Regulations, 2015, of the Telecom Regulatory Authority of India(TRAI) which made it mandatory for mobile network companies to compensate subscribers for call drops. The Supreme Court on Wednesday allowed the Income Tax department to reopen a 2001 tax case against super star Amitabh Bachchan pertaining to this income from the show KaunBanegaCrorepati (KBC). The two Judge Bench of the Supreme Court on Wednesday made certain significant observations relating to transparency, right to information and openness in Governance. The Bench while declaring the Telecom Consumers Protection (Ninth Amendment) Regulations, 2015 ultra vires the TRAI Act and violative of Articles 14 and 19(1)(g) of the Constitution, held that the RTIAct of 2005 has gone a long way to strengthen democracy by requiring that the Government be transparent in its actions, so that an informed citizenry is able then to contain corruption, and hold Governments and their instrumentalities accountable to the people of India. The Supreme Court on Thursday issued notice to Centre on a public interest litigation which sought immediate directions to double the number of judges in the country as recommended by the Law Commission in its 245th report in view of the growing pendency which has now touched an alarming 3.3 crore in the country. The Apex Court asked the SpiceJet Ltd to pay Rupees Ten Lakhs to Jeeja Ghosh, an eminent activist involved in disability rights, for forcibly de-boarding her by the flight crew, because of her disability. Apex Court bench comprising of Justices A.K. Sikri and R.K. Agrawal also issued the guidelines with regard to ‘carriage’ by persons with disabilities and/or persons with reduced mobility and observed that People with disabilities also have the Right to Live with Dignity. The Apex Court on Wednesday declared the results of floor test held at Uttarkhand Assembly on tuesday. The Court has found that Harish Rawat has obtained 33 votes out of 61 votes and declared that his government proved the Majority in the House. The Supreme Court on Thursday issued notice on a Public Interest Litigation filed by NGO, Angel Trust, seeking stricter penalty in cases of animal cruelty in the wake if increased number of cases in the country where animals have been cruelly killed or hit. The Supreme Court held that if two views are there regarding the age, the benefit of Juvenility cannot be given to Accused involved in grave and serious offence. Apex Court bench comprising of Justices A.K. Sikri and R. K. Agrawal in Parag Bhati vs. State of Uttar Pradesh observed that benefit of the principle of benevolent legislation attached to the Juvenile Justice Act would apply to only such cases wherein the accused is held to be a juvenile on the basis of at 24 least prima facie evidence regarding his minority. A Supreme Court bench on Thursday, gave a split judgment in an appeal by Medical Students from MP who were admitted between 2007-2012, whose PMT exams were cancelled for their alleged involvement in Exam Malpractices (VYAPAM scam). Though the bench comprising of Justices J.Chalameswar and A.M.Sapre were in agreement that the judgment appealed against need not be interfered with, they expressed different opinion on whether to give directions excercising power under Article 142 of the Constitution of India. A two Judge Bench of the Supreme Court on Friday upheld the Constitutional Validity of Sections 499 to 502[ [Chapter XXI]] of IPC relating to Criminal Defamation. The Bench comprising of Justices Dipak Misra and PC.Pant held that the right to Life under Article 21 includes right to reputation. The Bench has dismissed the Petitions filed by Subramanian Swamy, Rahul Gandhi and Aravind Kejriwal challenging the law relating to Criminal Defamation in India. The Supreme Court issued Directions to the Government on Implementation of the Mahatma Gandhi National Rural Employment Guarantee Act, 2005 and the Mahatma Gandhi National Rural Employment Guarantee Scheme framed under the provisions of Section 4 of the said Act. The Directions are issued in the Third Part of SWARAJ ABHIYAN Judgment. The Supreme Court on Friday also issued Directions relating to the implementation of the National Food Security Act, 2013 on Part-II of the SwarajAbhiyan Judgment. In yet another judgment concerning the issue of draught, the Supreme Court directed the Central and State Government authorities and the RBI and other banks to religiously implement their policies concerning issues regarding establishing fodder banks or restructuring bank loans. Supreme Court observed that if damage to a party has resulted from two or three causes, namely, from an act of God as well as a negligent act of a party, the award of damages can be apportioned to compensate only the injury that can be attributed to the negligence of the party. Reiterating that Article 14 of the constitution of India does not envisage negative equality, the Supreme Court observed that grant of benefit to some persons by illegality or mistake does not confer right upon others to claim equality. A Supreme Court bench upholding the decreeing of a suit by First Appellate Court, reiterated that the entry of possession in some revenue records simplicitor does not confer any right to retain the possession. Supreme Court rejected CBI investigation plea of wife of a naval officer who alleged that her husband and In Laws subjected her to mental and physical cruelty and also complained against five other naval officer including wife of one, alleging wife swapping and sexual abuse.Three judge Bench headed by the Chief Justice T.S. Thakur, however directed the state to constitute a Special Investigation Team by an officer not below the rank of Deputy Inspector General of Police to investigate the matter. After taking the views of CA Sundaram, the senior counsel for the nine disqualified MLAs,andKapilSibal, the senior counsel for the restored chief minister, Harish Rawat, The Supreme Court bench on Friday decided, that the nine disqualified MLAs would continue to enjoy facilities accorded to them as a legislator, even though they are not entitled to claim their salaries as MLAs during the period of disqualification. Setting aside the Judgment of the High Court, the Supreme Court held that a Magistrate is duly empowered to grant tender of pardon even in respect of the cases which are triable by the Session Court or by the Special Judge for the offences under Prevention of Corruption Act. Supreme Court made some pertinent observations about Land acquisition by the State and private builder benefitting in the process. The Bench comprising of Justices Anil R. Dave and Adarsh Kumar Goel observed that land acquired for housing purpose must revert back to owner, and not to anyone else directly or indirectly. The Supreme Court has upheld conviction of ten persons by TADA Court, in 1993 Rajdhani Express Serial Blast case. The Apex Court bench acquitted 4 accused who were convicted by the TADA court.